With increasing demands from their customers, restaurateurs have to rely more and more on innovations. New and interesting formats along with experimental cuisines are fast becoming the choice of discerning restaurant-goers. Glocal Junction is the newest addition to this space, opening their outlet in Hyderabad after a very successful run in Mumbai. 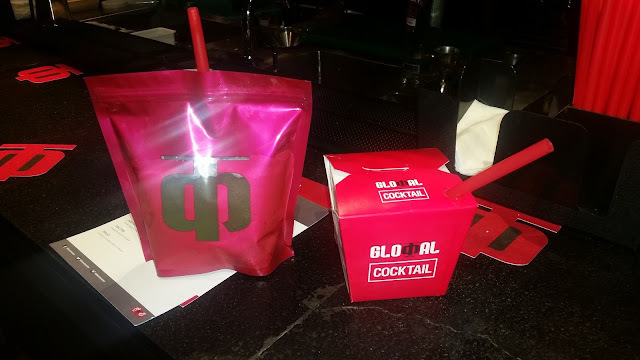 Glocal Junction defines its clientele as people who are global in their appearance but local in their hearts. The casual look of the place, as well as the style of cuisine, reinforces this. The restaurant starts as a quiet relaxing place in the late morning transforming itself into a buzzing and happening place in the night. Invited for a preview of their brand new outlet in Hyderabad, one could not help but admire the open design of the two-storied restaurant. There is also ample seating on the outside for the people who like an open ambience. The live kitchen is in the ground floor whereas the bar is upstairs. There is innovation everywhere – be it the design of the cutlery, presentation of the food or even the coasters on your table. As we settled down, we met Chef Gaurav Gidwani, who briefed us about the menu. The highlight of the dishes here is that they have combined various ingredients, cuisines and techniques into contemporary items. 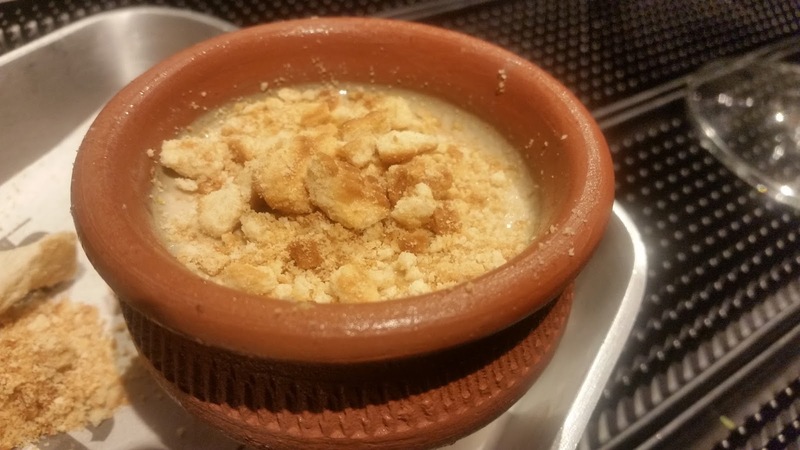 Random examples are Hot Tennessee Barrah, or the Masala Chai Panacotta. Glocal Junction has two menus – one for the day and one for the night. For the preview, the plan was to present select dishes from both the menus. From their bar menu, I picked a cocktail called Black Magic – smoked whisky with bitters and orange zest oil. 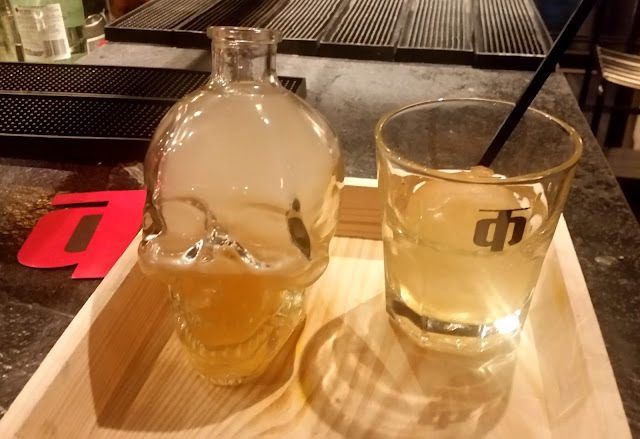 I loved the way it was served in a skull shaped glass container - one thing to note about this place is surely the presentation of their cocktails. 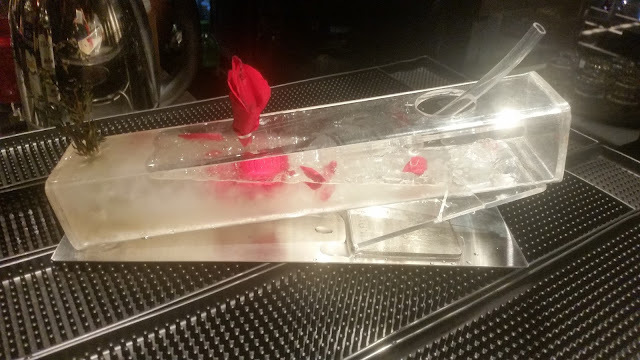 This was a strong drink, and the bitters added a nice flavour to it. 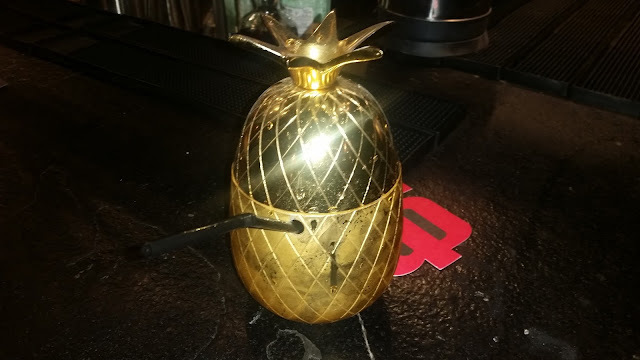 Talking about presentation Mirage, a vodka based cocktail was served in a golden pineapple shaped pot. Thailee, a muskmelon flavoured vodka drink in a plastic sachet was delicious, while Bouquet, a passion fruit flavoured drink impressed. 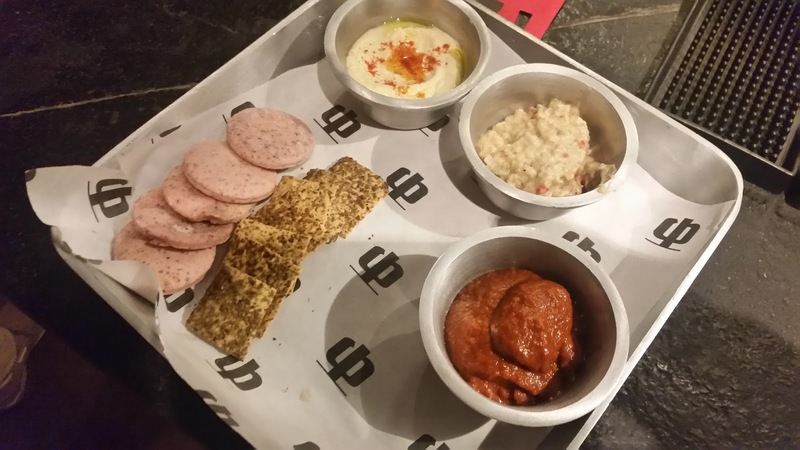 The starter that had the highest demand was the Arab Ki Thali – hummus, babaganoush and hareesa served with small pita breads and zatar topped lavash. 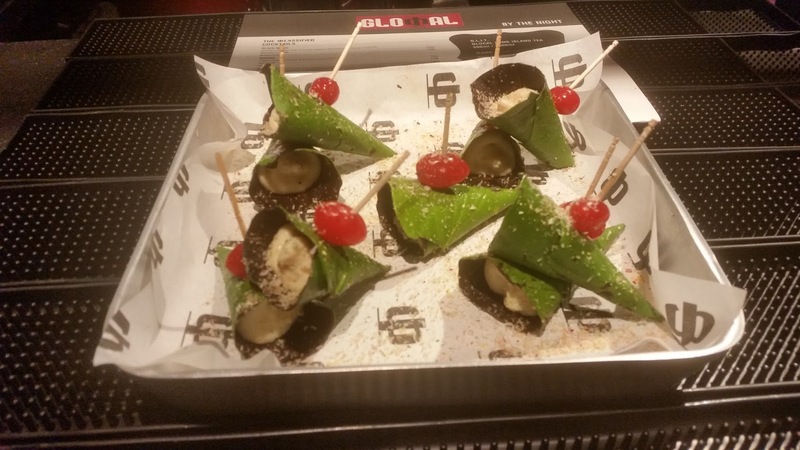 The bellpaper flavoured babaganoush gave a different twist to the familiar dish. The smokey flavoured hummus was also very good. 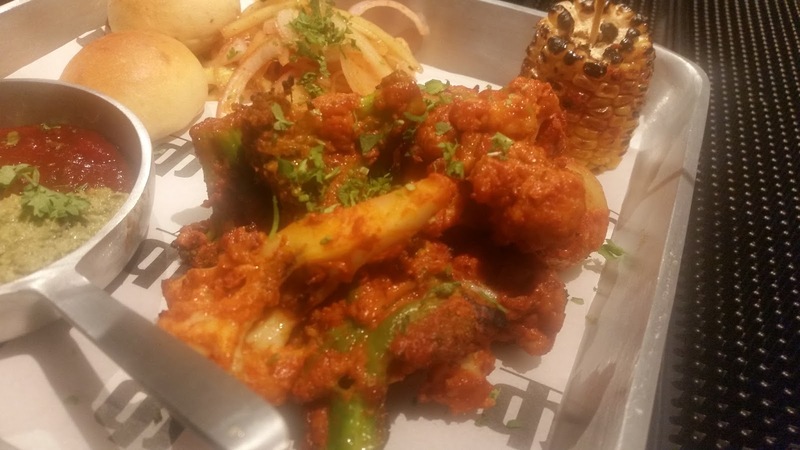 Coorgi Murgi Dry Fry and Sriracha Koliwada Prawn were both ideal foils to the drinks served. 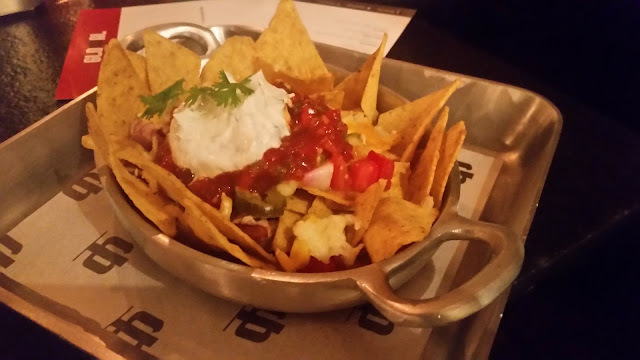 The other starter Classic Nachos served with cottage cheese, salsa and sour cream was a delightful combo. 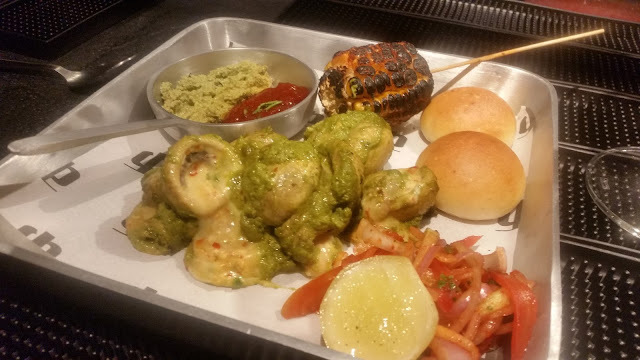 The menu had a section called “Cooked over a Pit”. 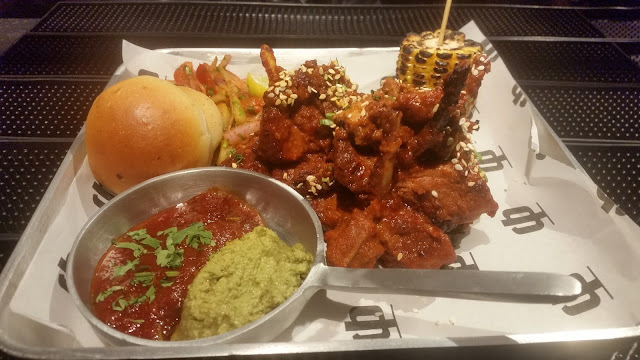 I had mentioned about Hot Tennessee Barrah: the soft lamb preparation in Tennessee barbecue sauce, served with bun and two savoury dips was loved by all. Broccoli with English Mustard and Cheese and Peanut Tamarind Marinated Cauliflower were two vegetarian dishes which even the non-vegetarians feasted on. Wild Mushroom and Cheddar Kabab was another item which can be safely recommended to any kumbh fan. I liked the look of Disco Anda Fry, but on tasting did not find it that special. LGBT Prawn Skewers had some soft and succulent prawns in lemon grass, basil and thyme marinade, as indicated in the name. 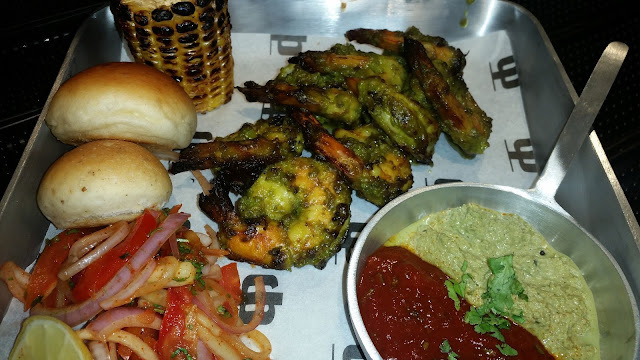 The green masala tasted delicious and the prawns were grilled just the right amount. The concept of Glocal was evident in the mains too. Chef Gaurav told us that it is the endeavor of the restaurant to have some items from the local cuisines wherever they set of shop. Oru Kodi Pulusu was the local item on the menu, a preparation of country chicken served with rice and papad and with a very fiery aftertaste. Golchina Mamsam was a spicy mutton preparation, which was brilliant. It was sad that I was already full and could try only couple of spoons. A fusion dish which was liked by many was Tandoori Chicken Risotto. Glocal Junction also has some detectable desserts many of which are again contemporary. 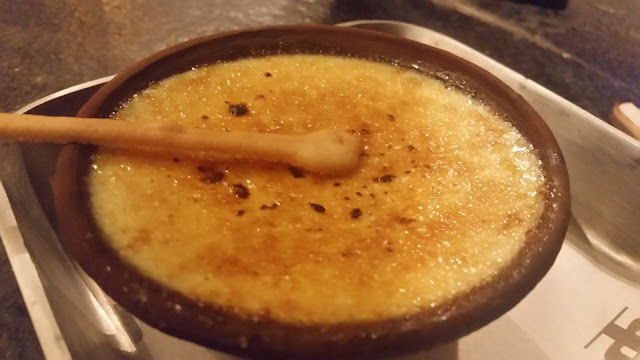 Masala Chai Pannacotta, Firni Crème Brulee are a few which deserve to be mentioned. Kolkata Pan Cheesecake had a brilliant presentation. For choco lovers, Toxic Mousse is a dessert not to be missed. In the melee to try out a lot of them, I missed the Beeramisu – I was told later that this was the top pick of many of my friends. Overall, Glocal Junction is a total package. Nice interiors, heady cocktails, a food menu which has something for everyone and some out-of-the-box desserts. 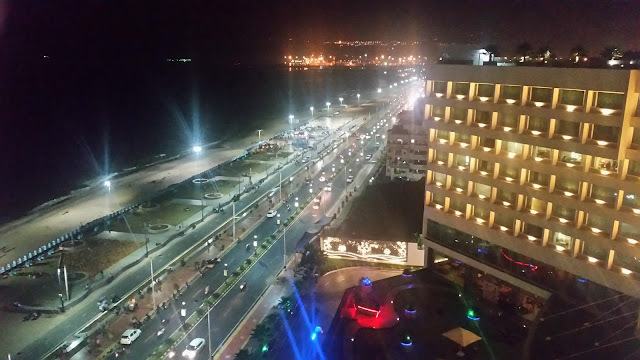 It will be interesting to see how the Hyderabadis embrace this new place in town, but going by initial reports it has surely become a happening place.